As Tom Paxton likes to note in his concerts, nostalgia is a cheap emotion. He subscribes to the theory (and so do I) that it’s OK to look back, as long as you don’t stare. Last night, I stared. It felt good. I’ll also note that I’m a native Angelino. For those unfamiliar with that term, that means that I’m native to Los Angeles. I was born here, and have lived all my life here. This is my city, and with all the quirks she may have (which are many), I still love her. Last week I was in the San Francisco Bay Area (as an aside, did you ever notice that folks there appear to think nothing else exists: “the City”, “the Bay Area”, “the East Bay”). Driving and navigating up there made me, yet again, appreciate Los Angeles. I’m an LA boy, and I’m proud of it. You can have New York or Chicago. LA is #1 to me. I’m mentioning all of this because last night I saw a love note to the city, of which there are very few [don’t believe me? Quick: Name 10 plays, movies, or musicals that celebrate Los Angeles. Now name 10 that celebrate New York. Which was easier.] This love note came from the fertile mind of Bruce Kimmel (FB) — the man behind one of my favorite small musicals (The Brain from Planet X) as well as the man behind Kritzerland Records. It was in the form of a revue — a style of musical less common these days. Revues take a particular subject, and present a series of scenes and songs from multiple artists all related to that subject. It was a style that fell out of the popular conscience with the advent of the TV variety show. This love note was titled: L.A. Now and Then, and was presented by the Theatre Academy (FB) and students at Los Angeles City College (FB); last night was the final performance. The focus of L.A. Now and Then is the Los Angeles of the somewhat near past. I characterize the timeframe that way because this show is not nostalgic for the earlier “then” — there are no songs celebrating the Zanja Madre, the opening of the Aquaduct, the bombing of the LA Times, the heyday of the Pacific Electric, and such. The audience that would remember those in the way they should be remember has passed away. Rather, this was a show that was aimed at the bulk of today’s theatre audience — men and women in the 40s through 70s that are nostalgic for the period between 1950 and perhaps the mid-1980s. The songs and scenes in the show celebrate that period. Looking back at the show (in retrospect, as the Lizards might say), I’m asking myself if there was a broader point being made about how the city has changed. I think there was, and I think it is captured in the ultimate point of the song “What’s So Good About the Good Old Days” — namely, that Los Angeles was a much simpler and warmer city, and something seems to have been lost in moving from where we were to what we are today. 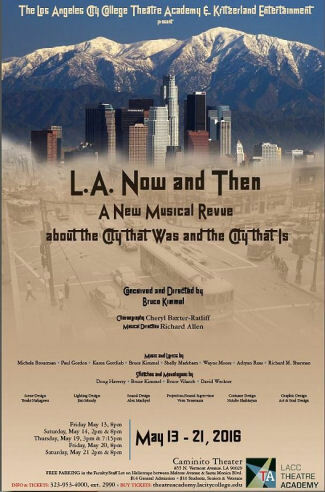 L.A. Now and Then, which features music and lyrics by Michele Brourman (FB), Grant Geissman (FB), Paul Gordon (FB), Karen Gottlieb/FB, Bruce Kimmel (FB), Shelly Markham (FB), Wayne Moore (FB), Adryan Russ (FB), Richard M. Sherman (FB), and the Sherman Brothers, and sketches and monologues by Doug Haverty (FB), Bruce Kimmel (FB), Bruce Vilanch (FB), and David Wechter, touches upon the following subjects from the history of LA: Helms Bakery Trucks, Laurel Canyon Rock Music, the wide variety of place names, C. C. Browns, childrens TV hosts, the Pan Pacific auditorium, the surfer culture, the Disney studios, wrestling and the Olympic Auditorium, disco, movie palaces, the Black Dahlia, Uber, Hallabaloo, the Dodgers, Christmas in LA, the Sunset Strip, and more. Based on my knowledge of LA history, there were no obvious errors (I had my fears when they mentioned the Red Cars in the opening number). Did it touch on everything it could have or should have? No. I can think of numerous things that should have been included, such as the San Fernando Valley (the prototypical suburb of the Brady Bunch); the penchant for theme parks, especially those that are gone such as Marineland, P.O.P., Kiddieland, and Busch Gardens; the freeway culture of the city, including how we always say “the” in front of freeways; the Westwood of yore; or a paean to the RTD. But you know what: they only had so much time, and could only include so much. They included enough for that quick look, and that’s better than the staring. “Weekday Heros”, perfromed by Bedjou Jean/FB, music and lyrics by Bruce Kimmel (FB). This was a lovely tribute to the live Children’s TV shows of the 1950s and 1960s. As someone who still uses the Birthday Cake Polka every day, this hit a nerve. The host that I remember that they missed was Sally Baker‘s Hobo Kelly. “There Once Was a Building”, performed by April Audia (FB), written by Bruce Kimmel (FB). A very loving tribute to the Pan Pacific Auditorium, as well as a telling commentary on how LA doesn’t preserve its history when it can, but then recreates its image of its history — through the rose colored glasses of memory — after the destruction. “The Whimsey Works”, performed by Robert Yacko (FB), music and lyrics by Richard M. Sherman (FB). A loving remembrance of the Walt Disney Animation Studio and of Walt Disney himself. “Every Wednesday Night”, performed by the entire cast, with music and lyrics by Bruce Kimmel (FB). A remembrance of the era of wrestling in general, and the Olympic Auditorium in particular. For me, the Olympic Auditorium wasn’t wrestling, but Roller Derby on the weekends. I even went one weekend with my grandmother. “The Black Dahlia”, performed by Elle Willgues/FB, music by Bruce Kimmel (FB), lyrics by Adryan Russ (FB). A very touching piece on Elizabeth Short — the Black Dahlia — and the continuing dream of starlets with respect to L.A.
“L.A. Uber Alles”, performed by Robert Yacko (FB) and Michael MacRae/FB, written by Bruce Vilanch (FB). An insider’s commentary on the Hollywood Foreign Press, and what’s behind the curtain of the Golden Globes. “Christmas in Los Angeles”, performed by Robert Yacko (FB), music and lyrics by the Sherman Brothers. A commentary on the incongruity of Christmas in Los Angeles. “We Look Ahead”, performed by Robert Yacko (FB) and the cast, written by Doug Haverty (FB), music and lyrics by Bruce Kimmel (FB). A very touching look at the changes in the gay community in Los Angeles, from the homophobic LAPD of the 60s to the acceptance and creation of West Hollywood. The cast — under the direction of Bruce Kimmel (FB) and choreography of Cheryl Baxter (FB) — consisted of two veterans and a collection of talented students from the LACC Theatre Academy (FB). The veterans were Robert Yacko (FB) and April Audia (FB). The students were Jenny Bacon/FB, Sarah Barnett/FB, Paola Fregoso/FB, Alexis Jackson/FB, Bedjou Jean/FB, Prisca Kim/FB, Michael MacRae/FB, Kole Martin/FB, Shawna Merkley (FB), Lamont Oakley/FB, Kasper Svendersen/FB, and Elle Willgues/FB. I called out some individual performances above, but it was difficult to match things up during the show with a name. A few other impressive performances: In every number that Alexis Jackson/FB was in, she grabbed the eye with her performace, her emotions, her fun, and her dancing. Kole Martin/FB was noteworthy in a number of scenes, but I particularly remember his wrestler from “Every Wednesday Night”. Prisca Kim/FB was also someone who caught the eye, but I particularly remember her real tears at the end of “We Look Ahead” — the song evidently hit a nerve and brought emotion forward — when then was conveyed to the audience through that tear. Very touching. Bedjou Jean/FB had very expressive face; in addition to the previously mentioned “Weekday Heroes”, I remember his face from his numbers in “What’s So Good About the Good Old Days”. Lamont Oakley/FB, did a great job on the rap number of the names of LA. All were great dancers. Further, it appears that the entire cast was having fun, and that fun was conveyed to the audience. Music was provided by the on-stage L.A. Now and Then Band, under the music direction of Richard Allen (FB), with Allen on keyboard, Randy Landas (FB) on bass, Ed Smith (FB) on drums, Grant Geissman (FB) on guitars and banjo, Dave Hill/FB on reeds, and Bob O’Donnell (FB) on trumpet. Orchestrations were by Lanny Meyers (FB). As mentioned earlier, the choreography was by Cheryl Baxter (FB). The show had a wide variety of dance styles, from the 50s and 60s rock dancing to disco, from slow numbers to fast numbers. All worked well, and were well executed. Turning to the production and creative side. The scenic design was by Tesshi Nakagawa (FB), with projection design and sound supervision by Vern Yonemura. The scenic design was simple: some white walls, some risers. The sense of place or history was provided by Yonemura’s projected images, and they worked well. Also establishing the sense of place was Natalya Shahinyan/FB and Min Lee’s costume design. In general, the designs worked well, although there were some minor historical inaccuracies (understandable given a college’s costuming budget) and minor “support” issues. None of the issues rose to the level of distracting or problematic or “WTF?”. The sound design was by Alex Mackyol/FB. It may have just been our performance, but there was something a little off in the sound. In speaking, voices were a little muffled or echo-chambery. I believe this came through to the singing as well: initially, I thought some of the students were a little flat (writing it off to “hey, they’re students”). I then realized it sounded that way across multiple students and in almost all individual vocal numbers; given the odds were low of every student and professional being flat, I realized it was the off-sound coming across in the music as well. It was minor and didn’t hurt the enjoyment once I realized it for what it was; if the show was continuing off, I would hope the sound would be tuned a bit. The lighting design was by Jim Moody. It worked well to establish mood, highlight performers, and support the sense of place without washing out the projections. Remaining technical credits: Graphic Design – Art & Soul Design ; Production Stage Manager – Joey Vreeland/FB; Executive Producer – Fred Martin; Assistant Stage Manager – Eric Sherman; Assistant Choreographer – Heather McKeown; Hip Hop Consultant – Brian Drake; House Managers – Joyce Lakin/FB and Mary Smith/FB. The LACC Theatre Academy is under the direction of Leslie Ferreira (FB), Department Chair. Alas, last night was the final performance of L.A. Now and Then. It was recorded; it is unknown if Kritzerland Records will be publishing the CD or just making it available to Indiegogo backers. There are also hints of a future life; I could easily see this show being successful at a mid-size house such as the Geffen, Colony, or Pasadena Playhouse. Ob. Disclaimer: I am not a trained theatre critic; I am, however, a regular theatre audience member. I’ve been attending live theatre and concerts in Los Angeles since 1972; I’ve been writing up my thoughts on theatre (and the shows I see) since 2004. I do not have theatre training (I’m a computer security specialist), but have learned a lot about theatre over my many years of attending theatre and talking to talented professionals. I pay for all my tickets unless otherwise noted. I am not compensated by anyone for doing these writeups in any way, shape, or form. I currently subscribe at Cabrillo Music Theatre (FB) and the Hollywood Pantages (FB); my subscription at The Colony Theatre (FB) has gone dormant, and REP East (FB) has seemingly gone dark for 2016. Through my theatre attendance I have made friends with cast, crew, and producers, but I do strive to not let those relationships color my writing (with one exception: when writing up children’s production, I focus on the positive — one gains nothing except bad karma by raking a child over the coals). I believe in telling you about the shows I see to help you form your opinion; it is up to you to determine the weight you give my writeups. Sun, 6/12: Titus Andronicus Jr. (700p); and then the Tony Awards when I get home. Whew. July brings us back to conventional theatre, with Beautiful at the Hollywood Pantages (FB) and the Western Corps Connection (FB) the first weekend, a HOLD for Grey Gardens at the Ahmanson Theatre (FB); the second weekend, The Little Mermaid at Cabrillo Music Theatre (FB); the third weekend, Weird Al Yankovic at the Hollywood Bowl (FB) and Operaworks (FB) Opera Re-Constructed at CSUN; the fourth weekend, a mid-week Hollywood Bowl (FB) concert of Wynton Marsalis and Aaron Copeland, and … currently nothing for the weekend. As of right now, August is completely open. One weekend has a bar mitzvah, and there are a few holds for show, but nothing is booked. Late August may see us looking at shows down San Diego/Escondido for one weekend. The best of the shows available — or at least the most interesting — is Titanic from Moonlight Stages. As always, I’m keeping my eyes open for interesting productions mentioned on sites such as Bitter-Lemons, and Musicals in LA, as well as productions I see on Goldstar, LA Stage Tix, Plays411 or that are sent to me by publicists or the venues themselves.